Originally from East London, South Africa, Nathan holds a Bachelor’s of Science Degree in Information Technology from the University of Wales. After working in the UK for two years, Nathan joined the largest privately owned company in South Africa, The Kempston Group. During his tenure at The Kempston Group, he implemented many project management processes and methodologies for the IT and agricultural communities and successfully managed multiple cross-functional projects. 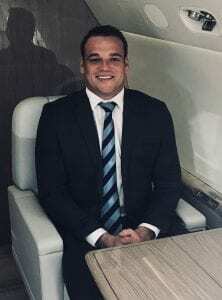 Nathan will work closely with Ted and Garett and has been appointed as Sales Manager for Nextant and Pre-Owned Aircraft based out of Dubai.